Original article appeared in A Saratoga Christmas on November 21, 2012. I love beautiful things, and in case this is the first time you’ve read my article, I will tell you my secret: I’m cheap. I never buy anything unless it’s on sale – and if I have a coupon – even better, and I scour the internet for the best finds in my budget to stretch every decorating dollar (or fashion cent, for that matter). Clearance sales make my pulse pound and finding ways to re-purpose things I already have for new and different uses completely makes my day. For me, holiday decorating is no different. And with the cost of just about everything rising these days, I’m sure I’m not alone in my quest of how to get “the look for less.” When I open the glossy pages of Elle Décor, House Beautiful and Country Living, I constantly fold pages, highlight website addresses and tear out pages for my “decorating book” (the files I’ve created over the years for my decorating projects like – Kitchen, Master Bath, Living Room and even Gardens). The downside to this is that my taste is too good for my budget. So, I am always on the lookout for similar items that I love that are in my budget (and no one will ever know the difference). With my Christmas decorations, I never have the same “look” two years in a row. Now don’t get me wrong, I do not go out and buy new decorations every year. I know people (who I will not name here) that put their decorations in the exact same place, every year, year after year. It never changes and they like it that way. That’s okay for them, but not for me; I am easily bored. I like to mix it up a bit. Some years, my tree is all gold and red ornaments, some years it’s silver and gold, and others it’s silver with natural elements like pinecones – but always with white lights – I’m a traditional kind of gal. In order to have enough ornaments in my rotation, I purchase my decorations when they go on sale or clearance. And, even when I use them two years in a row, I always move them around so I don’t have to look at the date of a picture to see if it was the same year. Last year, I actually broke my rule – don’t be too harsh, it just about killed me – and purchased ornaments and decorations BEFORE Christmas. I didn’t even wait for a sale. I know, you’re disappointed but in my defense, I decided I wanted to go green and silver as I was decorating my tree. I didn’t have any green ornaments so I had to bite the bullet and forego the after-Christmas clearance sales. I looked at my usual favorites like Pottery Barn, West Elm and Crate and Barrel, and truthfully, they did have a gorgeous selection, but considering I was going to decorate a whole tree, I realized quickly that I would go broke if I bought dozens of ornaments before Christmas. Thankfully we have two little gems around here called TJMaxx and Marshalls, and again thankfully, green was a big color last Christmas. I purchased all of the green ornaments Marshalls had in stock, which was only about 15 or 20. After adding in a couple of cute mercury glass owls, and a mercury glass tree from Pottery Barn, I’d spent my entire budget. With only 20 or so ornaments, it was clear that I didn’t have enough to cover the whole tree, so I improvised. 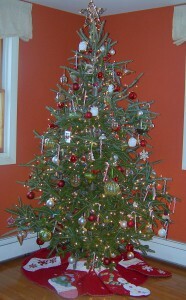 I have tons of red ornaments so I did a red, green and white tree, and let me tell you – it was my favorite tree to date. I’m sure you can just about now that I’m a bit of a perfectionist but I also know that one of the best secrets of good design is being flexible. It’s not always possible to find exactly what you want in your budget (or at all!) so changing the plan to get a look you love can sometimes be a trade-off. And it’s perfectly okay. So now that I’ve given you a few things to think about when it comes to your decorating, here are a few tips for beautiful, budget decorating which will help you have a fresh look every year – no matter which winter holiday you celebrate. Place natural elements like acorns, pinecones and evergreen branches in large bowls or platters and insert candles for a beautiful, unique centerpiece (use glass hurricanes to keep it safe). Spray evergreen branches with silver or gold paint and place along the tree branches as decoration or in vases with berry branches around your home. You can also create your own garlands by attaching them to the balustrades on your stairs. Bump up the beauty factor of your store-bought garland by weaving evergreen branches (and some that you painted in the idea above) and other pretty natural elements like berries and pinecones throughout the length. Try inserting stems into the existing twine or wire, or cut a small piece of wire and connect the new piece to the garland. Also add shatter-proof bulbs and decorations to make a truly custom look. Sapphire and silver, magenta and amethyst, and silver/gold and white are great alternative color palettes for Christmas. For Hanukah, blue and white is the traditional combination but in rooms where less formal traditions are recognized, sprinkling in elements of silver would be perfectly appropriate. Use a theme – think Adirondack simplicity, Victorian extravagance, sleek modern or soft and pretty country. There are lots of great stores to find theme accessories without breaking the bank. Start with basic ornaments from Target – they often have the latest trend in holiday decorating too so be sure to look for their individual and small set collections – and add pieces that lend themselves to your theme. Many of our local boutiques carry holiday items that will help you complete your look. Mix it up – After you’ve had a few years to build up your “back stock” of ornaments, consider changing your palette from year to year to keep your décor fresh and new. And add new elements to your theme each year so you don’t have to look at the date on your photos to recall when it was taken. Weave glass bead or evergreen garlands in and out of the arms of your chandelier and hang glass balls with silk ribbons at different levels to add interest. You can also add natural elements like pinecones and acorns to create visual tension between the sparkly and the natural. Need some ideas for all of those cards? Instead of hanging them all over the fridge, display them with garlands on entertainment units, coffee tables, and as framed artwork. 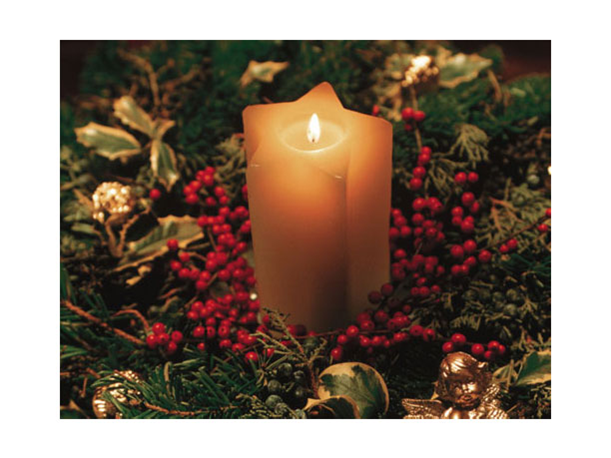 You can also attach them to large ribbons and hang the ribbons in prominent places in your home like the mantel (if you do not have a real fire) or down the fronts of interior doors. If you have some ornaments that you didn’t use on your tree, fill pretty bowls with them, insert some fresh evergreens and leave in your bathrooms, hallways and other common areas. I cringe when I see a tree with a few sparse decorations and lights wrapped in neat little rows around the outside of a tree. To get a tree that literally shines from the inside out, wrap individual branches with lights from the trunk out to the ends of the tips. To add to the 3-D effect, don’t limit your ornaments to just the end of the branches. 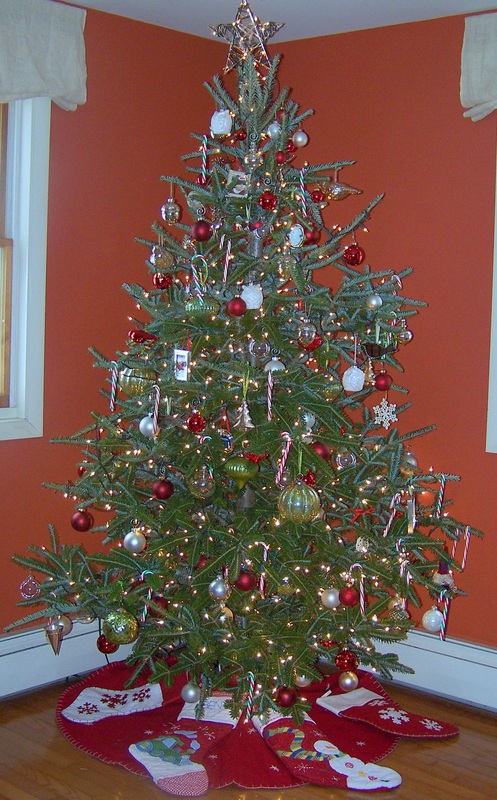 Use your larger, heavier ornaments inside the branches (be sure to do a heavy pruning to create space inside the tree) and put smaller ornaments toward the ends. Step back and make sure you’re not putting too many of the same size, color or shape in the same spot. With so many pretty candy cane colors on the market now, you are sure to find some that compliment your theme. Also place some to the inside of the tree as well as the outside of the branches. 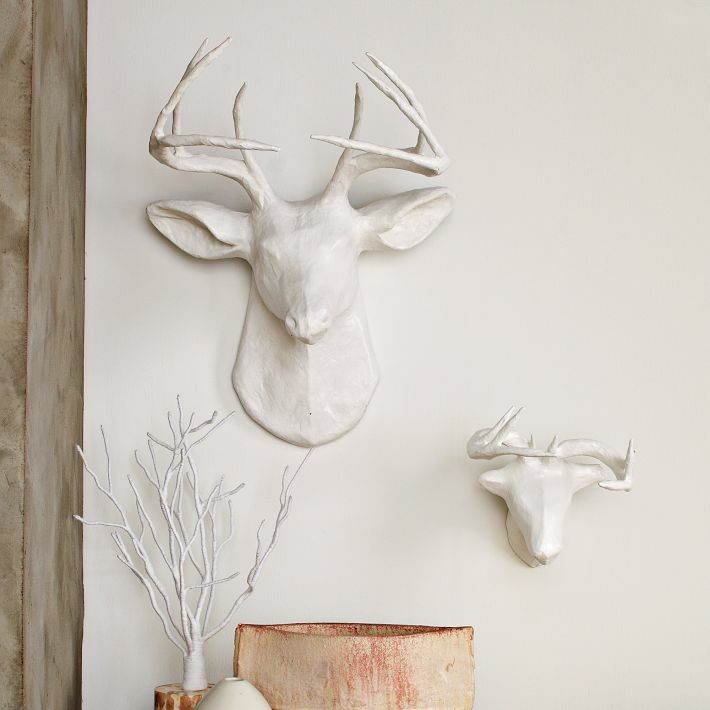 When creating a mantel display, more really is merrier. 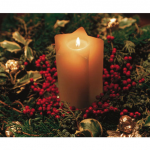 Don’t stop at putting out the stocking holders and candles or a few cards. Add garlands, glass hurricanes filled with candles or greenery, and add some ornaments or other sparkly items. Lots of stores now have “mercury” glass decorations that can add a dramatic flair to just about any décor. Wait another week or two and pretty much every store will have out their holiday inventory, if they don’t already! If you don’t have time to create the perfect holiday display, don’t worry! With my One Day Makeover, you can have a beautiful winter wonderland without spending a lot of time or money. But with less than two months before Christmas, don’t wait to book your in-home appointment! I can re-arrange your space for a party, decorate for that special Christmas morning or create a one-of-a-kind outdoor display. 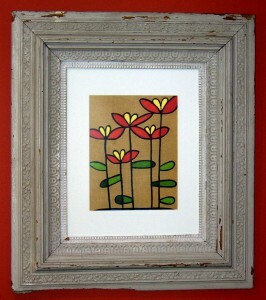 Be sure to find me on Facebook and my website: www.locustgrovedesigns.com. Happy Holidays! Ah, fall. As much as I love the change of seasons, fall signals that winter is coming, and as a transplant from Texas, winter is not something I look forward to. That said, I love autumn colors and love decorating for fall. Here are some of my favorite, budget-friendly tips – you can use these tips on a big budget too by making just a few tweaks or hiring a professional decorator to help. Bring the outside in.Nature provides a splendor of beautiful decorations this time of year. Dried Japanese lanterns, cherry blossom branches with berries, bittersweet vine, and pinecones can help transition your summer décor into fall absolutely free. 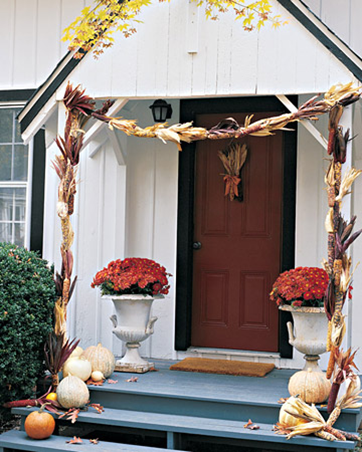 Bittersweet vine wrapped around doorways, porch columns and mailbox posts can soften the hard lines and make a welcoming entrance. You can usually find this at farmers’ markets or stop along any country road and cut some for free.To create a beautiful fall bouquet that will last long into the spring, remove the leaves from Japanese lanterns and they will eventually dry to a crisp orange. Fill galvanized buckets and ironstone pitchers and place them in bathrooms, on hall tables and living room mantels (remove them before starting up the fireplace). If you have a screened in porch, add them to the table (or even in a corner) for a little shot of color to your outdoor space. Berry branches make a gorgeous and colorful addition to dining room tables and entry halls when displayed in tall, glass containers (try filling clear containers with cranberries or marbles first) or in vases placed in large garden urns. Just be sure that whatever you put them in is water tight to avoid marks on your tables. And change the water every couple of days so it doesn’t start to look like a science experiment. Add a variety of pinecones from different types of evergreens to large bowls or glass urns and place around the house on counters and tables. You can also insert a candle in the center (use a fireproof holder) or add a mix of potpourri for a sweet scent. One final gift from nature – tree branches. Yes, you read that right. Tree branches get interesting when spray painted silver, gold, bronze or other warm, fall colors and displayed in dramatic containers. The trick with branches is to use fairly straight branches and keep them tall. If you can cut some with pretty leaves, even better. 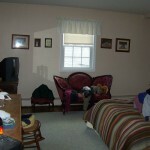 budget, an easy way to do this is to change out pillow covers, throw blankets, rugs and lamp shades. Now, I know you’re thinking, “Budget? That’s going to cost a fortune!” but it doesn’t have to. There are lots of budget-friendly places to pick up inexpensive accessories. Target, Home Goods, West Elm, Pottery Barn and many others offer lots of great choice that are easy on your wallet. I am not normally a Kirkland’s shopper but stopped in the other day and was pleasantly surprised at the variety and styling of their fall accessories. Lots of cute pumpkins and gourds in great colors and fabrics like burlap and glass, sparkly birds and jewel-toned candle holders. Don’t forget to scope out our local boutiques for more custom pieces. Miss Scarlett’s always has cute Anthropologie close outs for a good price and if your budget allows, you could check out Schuyler Pond, Homessence and Next Summer in Saratoga Springs. Another way to add color, but a little more expensive is to paint a room. If you already have great accessories with warm fall colors, choose your favorite color from say, a pillow cover and start painting. Some of my favorite fall colors are Salsa Dancing, A Walk in the Grass, Vintage Wine and Caliente from the Benjamin Moore Aura line. If you don’t want to change your wall color every season, choose one that’s fairly neutral so you can easily swap out your accessories in the next season for an extra budget boost. If you’re really handy but short on budget, a quick and easy update is to paint a door. I recently painted the interior of my front doors a bright yellow (it was summer!) to give my dark, stained doors an update. Now I know there are many of you out there thinking you are never supposed to paint wood, but my philosophy is – if you don’t love it, then paint it! My beautiful antique doors are old pine but were ruined by a botched stain job (not me!) so there was really no option but to paint them. They look so bright and I smile every time I walk down the hall. For fall, you could choose a jewel-toned red, black, dark gray or even a deep turquoise. If you decide that you want to change it out in the spring, you’re only committed to $25 and about 2 hours of work. Decorate the unexpected. In my home, nothing is off-limits from a little makeover. The toilet tank regularly has a flower posy in an antique ointment or Mason jar, and my office has an ever-changing assortment of containers for post it notes, paper clips, pens and flowers. Milk glass containers are my favorite, followed by little ironstone pitchers and dishes. And even the hallway console frequently gets a change out of accessories and flowers to keep it from getting boring. Your dining room table probably has the standard-issue vase of flowers but try something new by adding a new burlap runner (burlap is a great, inexpensive fabric), sprinkle it with brightly colored fall leaves, and intersperse tiny gourds and votive candles for a sophisticated, budget friendly makeover. 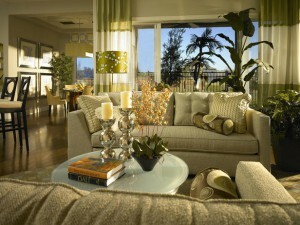 And don’t feel beholden to one style; add elements from other styles. If you have contemporary décor, soften the sometimes harsh lines with an antique mirror or mercury glass accessories. Or throw in a fun element like a papier mâché animal head in a Victorian-styled living room. 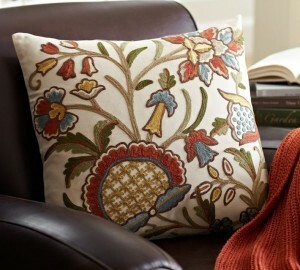 One of my current favorites is at West Elm and is a bargain at just $90. Do you have a decorating tip to share? Post your comment here! Need some help getting ready for your next holiday party? Contact me today to schedule your in-home appointment! I love beautiful things, and in case this is the first time you’ve read my blog, I will tell you my secret: I’m cheap. Clearance sales make my pulse pound and finding ways to re-purpose things I already have for new and different uses completely makes my day. I never have the same “look” for Christmas two years in a row and if you follow my tips for beautiful, budget decorating, you can have a fresh look every year that your family will be talking about for years to come (or at least until next year when you blow them away again!). In keeping with my love of all things cheap, of course I turn to nature to provide me with beautiful things that I don’t have to pay for. I live out in the country so there is always something pretty to to collect and bring inside. Place natural elements like acorns, pine cones and evergreen branches in large bowls or platters and insert candles for a beautiful, unique centerpiece (use glass hurricanes to keep it safe). Spray evergreen branches with silver or gold paint and place in tree as decoration or in vases around your home. Bump up the beauty factor of your store-bought garland by weaving evergreen branches and other pretty natural elements throughout. Sapphire and silver, magenta and amethyst, and silver/gold and white are great alternative color palettes for Christmas. 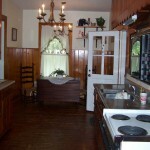 Use a theme – Adirondack, Victorian, modern or country. Mix it up – use a different palette or theme each year so you don’t have to look at the date on your photos to recall when it was taken. Whoever said that decorating has to be relegated to front doors and Christmas trees. There are lots of areas in your home screaming for a little piece of the action. 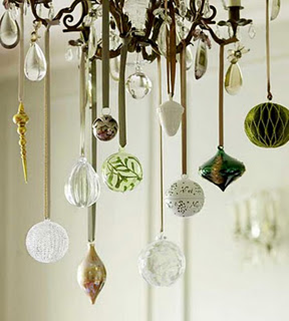 Weave glass bead or evergreen garlands in and out of the arms of your chandelier and hang glass balls with silk ribbons at different levels to add interest. Place cards and garlands on TV units, coffee tables, and artwork. One year I used wide gross grain ribbons down the sides of our TV unit and stapled our cards to them. It was so wonderful to look at every time we walked into the living room and to think about our friends and family. Fill bowls with bright, shiny Christmas balls and leave in bathrooms and on hallway console tables. If you don’t have time to create the perfect holiday display, don’t worry! With my One Day Makeover, you can have a beautiful winter wonderland without spending a lot of time or money. But with just two weeks before Christmas, don’t wait to book your in-home appointment! I can re-arrange your space for a party, decorate for that special Christmas morning or create a one-of-a-kind outdoor display. Be sure to find me on Facebook. Fall is officially here so start bringing out those fall decorations to get ready for the upcoming holidays. 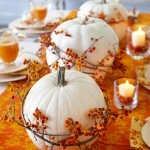 One of the easiest ways to stretch your budget is by using fall décor rather than Halloween or Thanksgiving décor. This simple step will take your home from September through November. Using in-season items will get you maximum impact for minimum dollars. Branches, vines, and gourds from your backyard, mixed with ceramic and wooden bowls, pottery, and lots of candles create a beautiful fall display for free! Mixing in natural elements with sparkly man-made elements creates visual tension and makes for a more interesting display. And don’t forget the after-Thanksgiving sales to get the best prices on holiday décor you can use year after year. Follow my tips for fall decorating and you’ll be sure to have a home your guests will be talking about for years to come. In the mudroom, pumpkins and pitchers or buckets of branches, bittersweet and Japanese Lanterns welcome visitors. 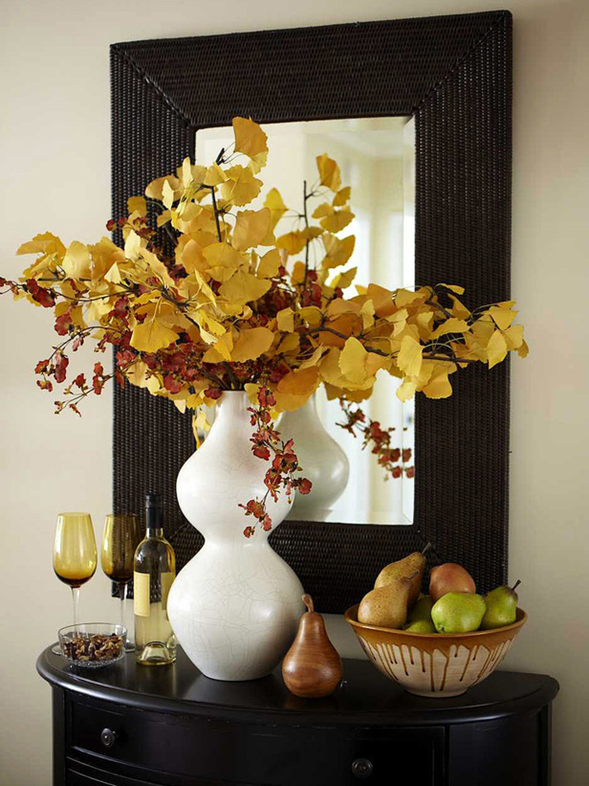 Place small gourds, candles and flowers on hall console tables and in bathrooms. Scatter pumpkins around entryways – group in odd numbers for interest. Fill window boxes with pumpkins, leaves and other fall foliage – fill them with fresh greenery for the winter months. twine as napkin rings, tie name tags to fruit stems, and decorate the table with brightly colored leaves. Use baskets, pitchers and buckets as vases (use a glass insert to keep it water tight). Fill wooden bowls or ceramic platters with apples, pears and fall colored fruit. 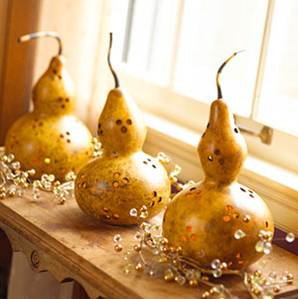 Use various sizes of pumpkins and gourds and mix in other natural elements. Weave white or orange lights through pumpkins. 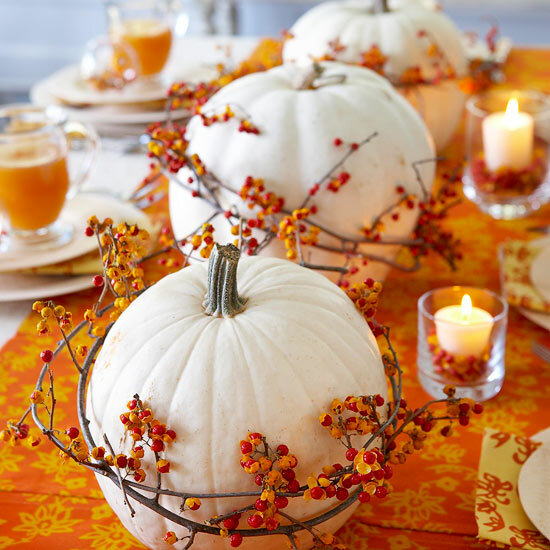 Create height with tall clear vases filled with candles or mini pumpkins. Are you hosting this year’s family get-together? Don’t have time to make the perfect display? 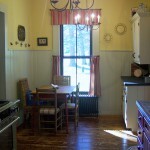 Or maybe your house has looked the same year after year and you’re ready for a change? 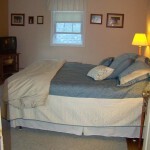 With my One Day Makeover, I can transform your home from ho-hum to Ho! Ho! Ho! Let me create that room for you so this year will be the one they remember! Contact me today to schedule your in-home consultation. Don’t delay, the holidays will be here quicker than you can say – I want to Love My Home Again! 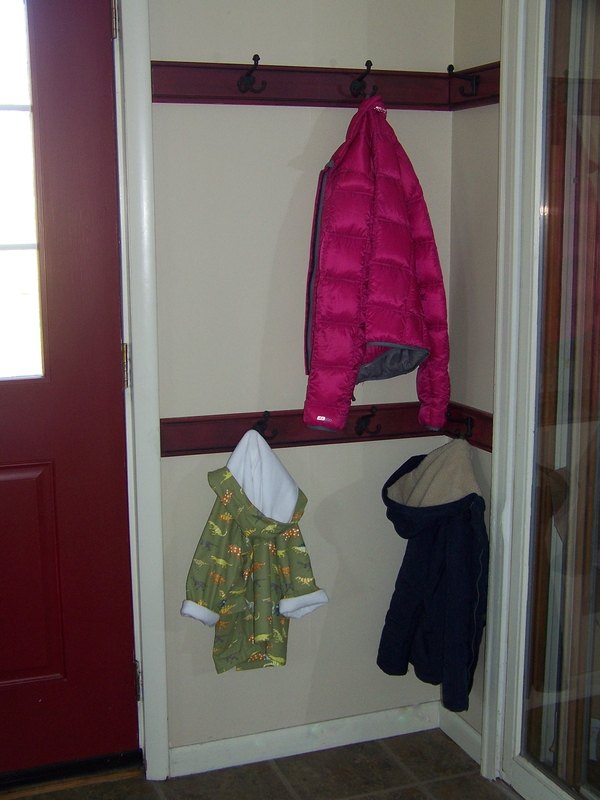 Clutter is everywhere – in our mudrooms, closets, drawers and sometimes in plain sight! Storage is a problem in every house, no matter how big or small. And add a kid or two (or four or five), and a husband, and it’s a recipe for more clutter than you ever thought possible. I am not a clutterbug. I like everything in its place (okay, I’m actually a little OCD) and it drives me crazy not to have stuff in its proper home. The only thing on my kitchen counter is a paper towel holder, and only because my husband insisted after we got married. I don’t want to look at coffee makers, Kitchenaid mixers, and microwaves. Tripping over bins of toys and craft supplies makes me nuts. Because I’m always looking for furniture and accessories for my clients, I’m always thinking of new ways to use things to clear the clutter that inevitably invades my home. Here are a few things I’ve come up with over the years to keep my family’s junk under wraps (and way under budget-mostly!). We have a huge mudroom. Because it’s a big room, my family dumped their shoes and coats everywhere. 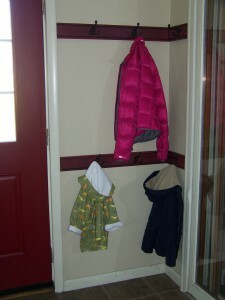 When we moved in, we had one coat rack for all of our coats, and two boot trays for our shoes. 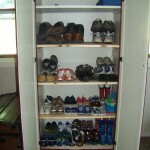 The problem: no one but me put their shoes and coats where they belonged. So after two years of griping at everyone (and picking up after them-and griping about that! ), I finally figured out a solution. My mother in law had given me an old cabinet a year before and I put it in my garage unsure of what to do with it. It was a shabby little thing with bowed paneling and stickers on the front. 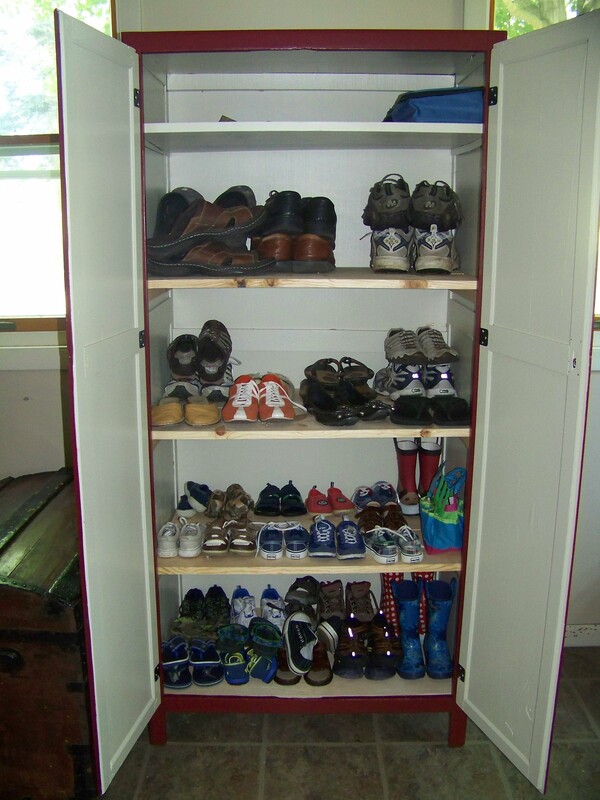 One day I was out in the garage, I saw the cabinet and thought with a coat of paint and some shelves, it might work for all of our shoes. I scrubbed off the stickers, painted several coats of bright red paint (my accent color), painted the existing hardware black, and had hubs add several thick pine shelves. The wood cost $35 but other than that, it didn’t cost me a dime. I also had several antique iron hooks and had him mill up some beaded boards. I painted the hooks black and did a red and black distressed paint treatment on the boards to make them look old. I hung one row at a kid-friendly height, another at my height, and a third at my husband’s height (on another wall). Another issue was the apparent procreation of our hats, mittens, scarves, plus the toys and garden tools. I had a shelving unit from Pottery Barn that once held my TV and stereo. 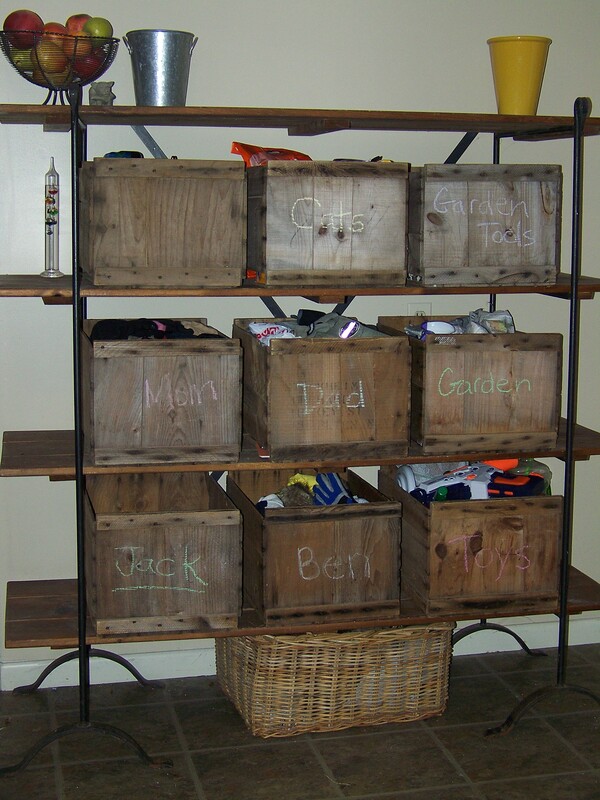 I put that in my mudroom, filled it with wooden apple crates and designated one crate to each person, plus extras for the toys, helmets, and gardening things. The wooden crates cost me $15 from a local apple orchard. Just today I bought three more to store the inevitable mess that accumulates from thin air (or my family!). The mudroom isn’t perfect, but until we’re ready to rebuild it (it will eventually be torn down and rebuilt as a proper mudroom) it serves its purpose well and is somewhat organized. If your family is anything like mine, your kids have more toys than 10 kids could ever play with in a lifetime. We’ve cut back buying toys quite a bit in the last couple of years but our boys get so much for their birthdays and Christmas, we were just running out of room to keep it all. We moved from a much smaller house so we didn’t have a lot of furniture when we moved into our current home. For two years, we made do with bins for toy storage. I had bins everywhere – lined up along the wall, stuffed under the coffee table, piled on top of each other in the corners of the room. I really hated them. One year for our anniversary, we decided to buy a large piece of furniture to store all the toys. We looked at new furniture but nothing felt right. On our anniversary, we got a sitter, headed to Troy (when it had lots of antique shops) and spent the day picking through shops. We finally came across a huge, oak laboratory cabinet that we both fell in love with. We hauled it home and filled it with toys (we call it the world’s most expensive toy box). After that, the rule was if it doesn’t fit in the cabinet, it doesn’t stay in the living room. It definitely wasn’t one of my bargain finds, but that’s okay. I don’t mind splurging every once in a while for something that speaks to me! And it’s really beautiful so we feel like we got double the pleasure from it! Once fall officially set in and I was freezing in my office, I decided to move to the living room for the winter (the woodstove keeps it toasty) and found myself in need of a desk (my kids’ craft table was not cutting it!). 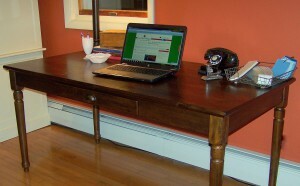 I had my eye on the Printer’s Desk at Pottery Barn for quite a while so I did splurged a bit on the desk. But after that, I was out of money for accessories. I often write about “shopping” your own house to get a new look without spending a penny. So following my own advice, I walked around my house, gathering this and that to stylize my desk. In my home, everything has to be pretty as well as functional. I don’t buy things because they’re practical if they don’t look good too. My kids’ crayons and markers are stored in antique wooden cheese boxes, I use old wire baskets for magazine and paper storage, and keep my pens in pretty vases. I grabbed a stack of Pottery Barn design books, topped it with my boys’ marker box, and filled an antique milk glass dish with my business cards. I added a lamp from my other desk, an antique stapler and an old black phone and my desk was complete. It looks beautiful and the accessories cost me nothing! And, it gave me the opportunity to move some things around in my other rooms, making them feel fresh too! I am going to repaint my lampshade to match my décor and liven up my little corner of the world (when I find the time). 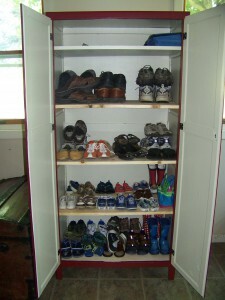 You don’t always have to spend a fortune to have the storage solutions that contain the clutter in your home. 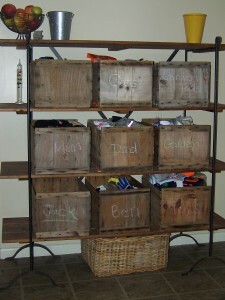 Antique dressers are some of my favorite storage solutions as are old wooden bowls and boxes. Have a piece that isn’t great but has the storage space you need? 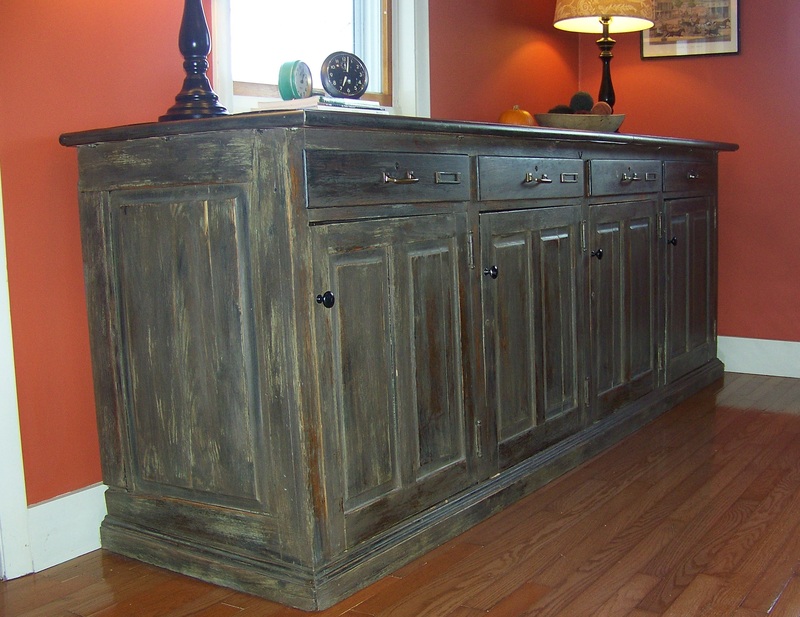 Try a new coat of paint and some new (or repainted) hardware. 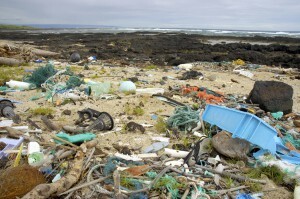 Look at the things you have and see if you can give them a new life with a little bit of imagination. And when you’re done, post a picture on my Facebook page! 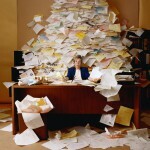 Not sure how to start organizing your clutter? Contact me to schedule your in-person consultation today! Need help picking out paint colors for your next project? Well, you’ve come to the right place! Download my free e-Book: How to Pick the Perfect Paint Color and your next project is sure to be a breeze! Never pick the paint color again and learn my tips for a successful paint job. To get your free e-book, fill out the form and it will be sent to you right away! And feel free to share this link with your friends, co-workers, on your Facebook page, to your Twitter followers, or with anyone else you think would appreciate it! HGTV makes it look easy: despite a $1,000 budget, the designer has fabulous fabrics which she whips into gorgeous slipcovers for $100 outlet chairs and amazing window treatments for only $100. Add the $2,000 rug she just happened to find on clearance for $199, the $500 lamps for $99 each, and the $5,000 sofa found at her local antique shop for $200 – in perfect condition, of course. All told, the room that could grace the cover of House Beautiful only took a half hour, and $997. If only decorating in real life were that easy! While decorating is fun, staying on budget and still creating a beautiful room can be challenging. But follow my secrets of good design, you too can have an amazing space without breaking the bank. Define your style. I talk to people all the time who have no idea of what they really like. Look at lots of pictures, magazine and websites, and pay attention to the styles that you respond to. Do you like country (or its modern cousin?)? What about contemporary? Folk art? Adirondack or mission? There are a plethora of styles so do some homework and figure out which one suits you (and your budget) best. Ethan Allen has a great online tool called What’s Your Signature? that helps you define your style through a series of pictures. I’m not saying you need to clear out your closest Ethan Allen, but use the things you love as inspiration for finding items in your budget. Create your own design library. 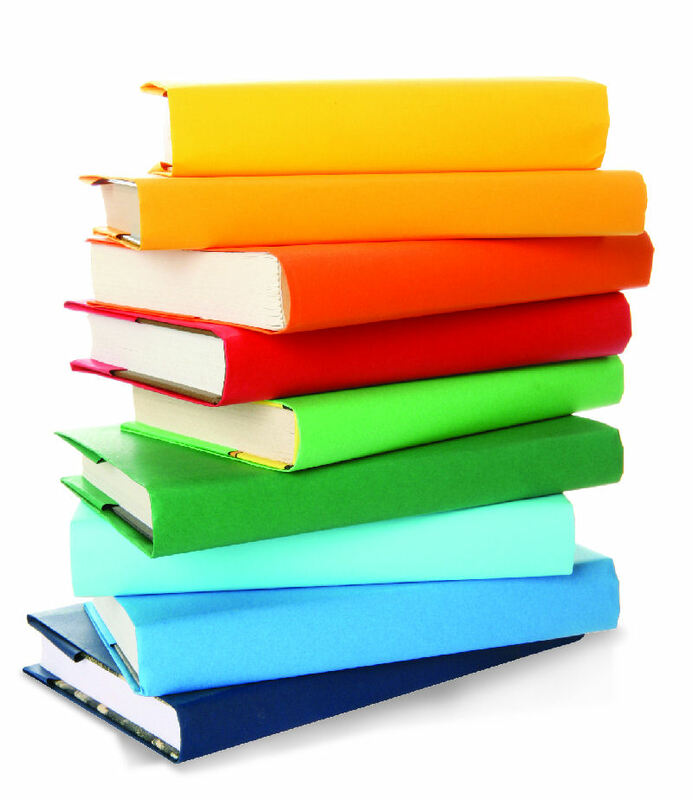 Tear out pages from your favorite magazines and catalogs. Keep pages separated by room or accessory (rugs, window treatments, wall décor) so you can find things easily when inspiration hits. I started collecting pages years ago and now have half a file cabinet drawer filled with thousands of ideas for everything from kitchens and baths, to kids rooms, and art. It’s really an invaluable resource. Shop. Visit stores and browse online – hit the national chains and your locally owned stores and boutiques. You don’t have to actually buy anything, but know the stores you like and check back frequently for sales, close-outs and new merchandise. LIKE your favorite stores’ Facebook pages and be the first to know of sales, coupons and specials. And don’t forget to bargain hunt on Craig’s List, Ebay and your local thrift stores (my personal favorite!). Only buy what you love. I know it’s tempting to buy something because it’s on sale, or it “goes” with your room, but if you don’t love it – and I mean, love it like you can’t live without it – then do not buy it. You’ll only end up throwing it out or giving it away later. Even if you have to save more money or wait until it goes on sale, it’s not a bargain unless you really love it. Try new things. Now, don’t get me wrong. I am not saying go out and drop $5,000 for a plum velvet Victorian sofa for your contemporary den (although, it could look fabulous!). But what I am saying is mix it up a little bit. If you like country, stick with it but throw in some elements from other styles. Or instead of the usual mid-tone country palette, use deeper hues to give it your own signature look. Mixing styles can be a great way to personalize your space. A contemporary element such as a piece of artwork or accessories in a country-style room can infuse energy into a room and creates your own personal style. How do you make your design dreams come true? LIKE my Facebook page, Locust Grove Designs, and tell me about your favorite projects and how you used ingenuity to get the room (or house) of your dreams. And I’ll give you lots of ideas for your next project!